TORONTO, ON--(Marketwired - November 02, 2016) - Porter Airlines kicks off the ski season with winter service between Billy Bishop Toronto City Airport and Mont Tremblant on December 9, 2016. Flights are available until April 3, 2017, with service up to six times weekly during the peak schedule. In less than 75 minutes, passengers can travel from downtown Toronto to the white slopes of Mont Tremblant. In addition to downhill skiing and snowboarding, winter in Tremblant offers an array of outdoor activities such as dog sledding, cross-country skiing, snowshoeing, and snowmobiling. For those who appreciate more calming pursuits, enjoy a slope-side spa, Scandinavian baths or eat and shop in the vibrant pedestrian village. Porter Escapes offers flight and hotel packages starting from $476 per person for a two-night stay. Prices are based on double occupancy, including taxes, fees, and airport transfers. For full package details visit www.porterescapes.com. Connecting flights to Mont Tremblant via Toronto are also available from numerous Porter destinations. The Mont Tremblant International Airport (MTIA) is offering passengers two special promotions this ski season. Passengers receive two free weekday ski lift tickets when they arrive on a Sunday or Monday and depart on a Thursday or Friday. Passengers travelling with children ages 2 to 12 years old are eligible for an airfare rebate courtesy of the MTIA airport. For full details of both offers, visit www.mtia.ca. Follow @PorterAirlines and @PorterEscapes on Twitter using #flyporter for travel tips on all of Porter's destinations. Porter Airlines has revolutionized short-haul flying with a warm and effortless approach to hospitality, restoring glamour and refinement to air travel. Porter Escapes provides a carefully curated menu of flights exclusive to Porter Airlines, hotels and unique leisure options to plan the perfect holiday. Flights and packages are available to Toronto, Ottawa, Montreal, Quebec City, Moncton, Halifax, St. John's, Thunder Bay, Sault Ste. Marie, Sudbury, Timmins, North Bay, Windsor, New York (Newark), Chicago (Midway), Boston, Washington (Dulles), Pittsburgh and with seasonal flights to Mt. Tremblant, Que., Myrtle Beach, S.C., Burlington, Vt., and Orlando-Melbourne, Fla. Vacation packages are available from Porter Escapes at www.porterescapes.com. 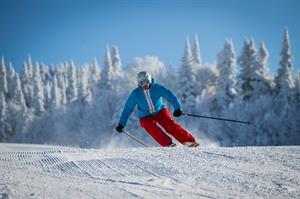 The ski season is launched at Tremblant!